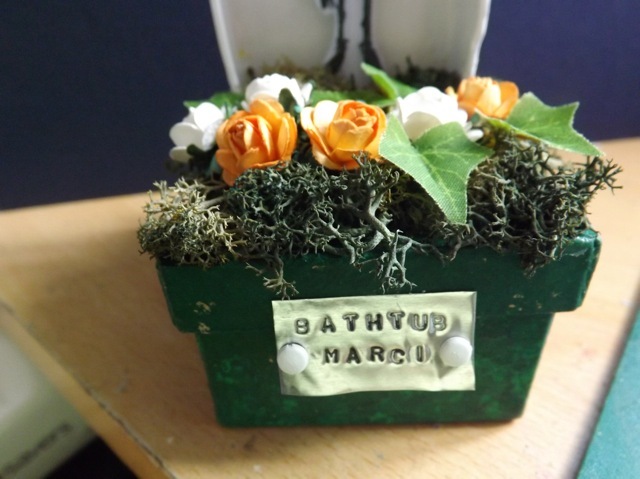 When I was thinking of the usual Bathtub Mary a couple of weeks ago, I had picked up a couple of little paper boxes from HobbyCraft – one was actually a flip-flop, the other a plain rectangle that fit the flip-flop inside – you see, these Mary’s are made from an old bathtub, partially submerged in the ground, with a stature of (usually, but sometimes Jesus or another saint) Mary placed inside. I wanted the bathtub shape to be able to be “submerged” in the box. I tried to convince DH to swing by the local Catholic church last week when we were out and about, to get one of those little dashboard statues, but no luck there. Then on Saturday, when I was literally RIGHT THERE (twice!) I forgot all about it. Good thing too or I might never have gotten to this version. 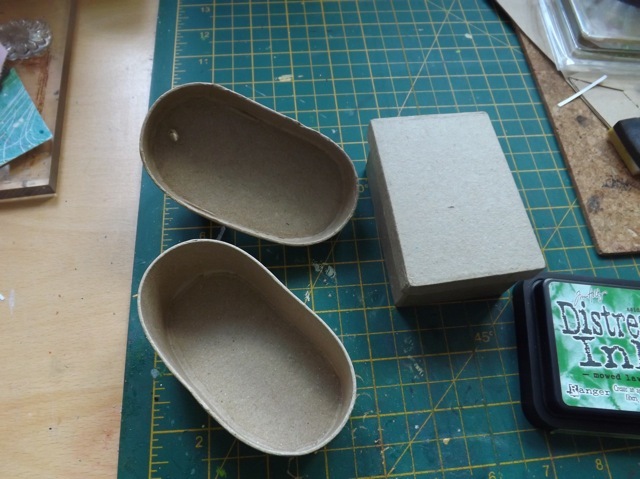 I snipped off the flip-flop part and used the lid, as it was a little more shallow, and seemed to work better than the quite deep base of the box. I painted it white, inside and out, and then gave it a coat of Mod Podge, so it looked a bit more like porcelain. I cut a thick slit-like hole in the lid of the box and sponged some green paint all over the lid and the box base. I stamped Marci three times, and coloured her in with my Copics, all identical. I chose as close to the Virgin Mary blues as I could find. 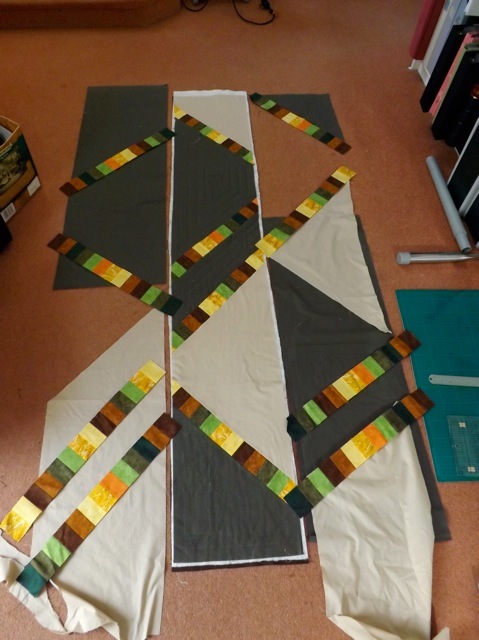 Then I cut her out – one with a border of white, which pretty much disappears against the white of the “tub” and two partial-cut ones, right along the edge. 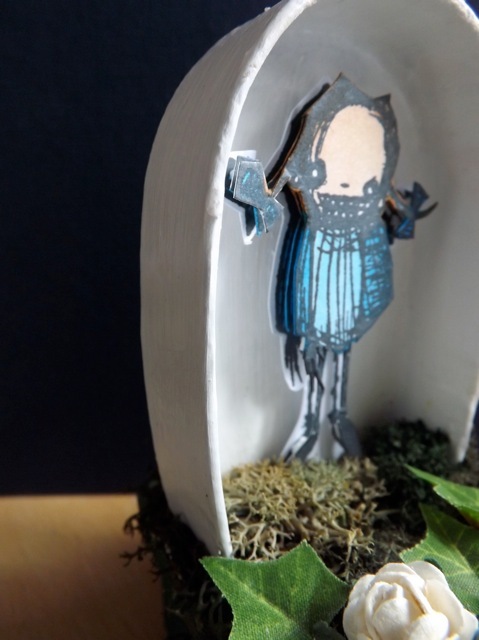 I layered them, as in decoupage (in the UK-cardmaking sense, not the glueing paper sense!) so I had a bit of a 3D version of her. I used the tiniest foam pads imaginable to stack the images. Maybe you can see how she is stacked up in this shot? 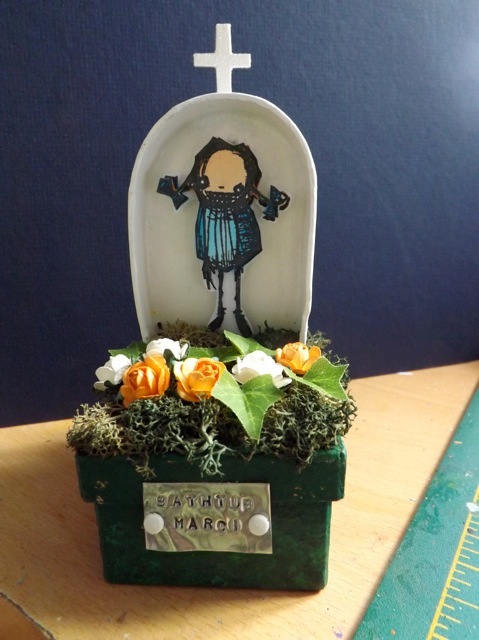 …and a little plaque which I made by finally dragging out the metal dies to stamp (letter by tiny letter) her name. I just love her, if I’m honest. She makes me smile every time my eye falls on her, sitting on my desk. Hope you like her too. I also wanted to test out the chalkboard-backer to see how I liked it. I think it ends up being dependant on having a good white pen! I did a more plain text version, as I thought the “handwritten” font would conflict with my OWN handwriting. I think I may use it. 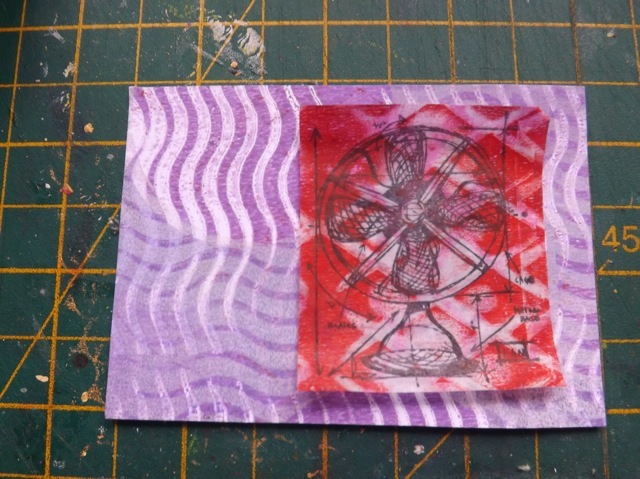 Now people who make ATCs a LOT can answer a question – on the series idea. If you say 1 of 5, 2 of 5, etc. does that imply that all in the series are EXACTLY the same? Would they be originals (i.e. 1 of 1) if there were only slight variations, like among these? I have no idea. 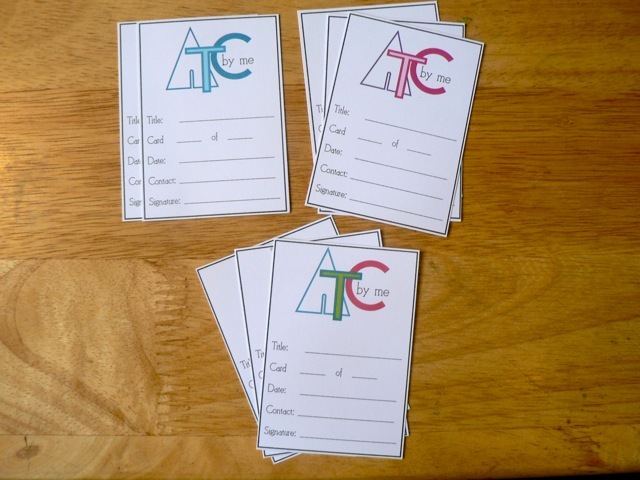 And a question on the backer – do you prefer them to be the EXACT size of the card or slightly smaller? I made this one slightly smaller, then wanted to make sure I covered the machine stitching so I had to shift it too far to the left for it to be centred. DOH! So before I print a whole sheet of them I have to decide. I’m happy to decide to make them slightly smaller, but if I were to share them as a download, it’d be better the know what those who might like them would do! 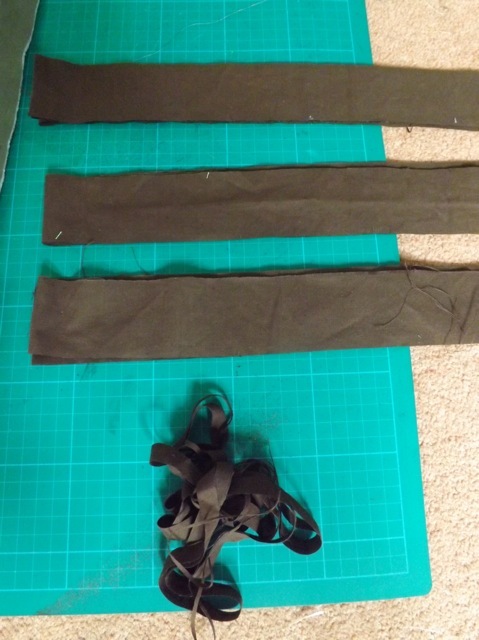 I guess if I made them exactly to fit, then you can always trim them smaller. so maybe that decision is already made LOL! 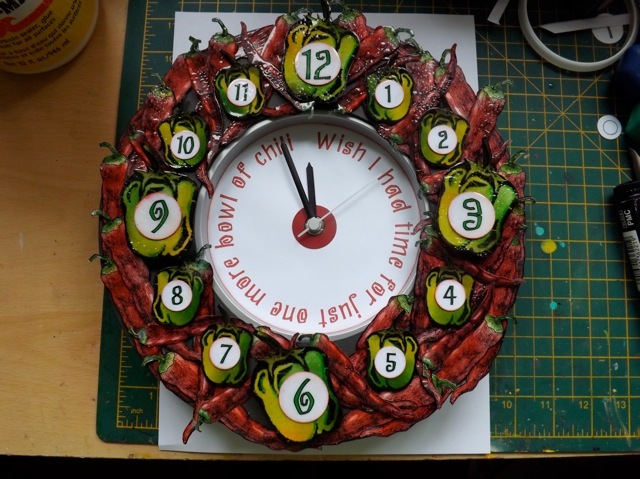 Off to a meeting, ho-hum…..
I’ve managed to finish up the chili clock – really happy with how it turned out. The quote is (supposedly) from Kit Carson – his lasts words, and clearly the perfect quote, as it mentions both TIME and CHILI! 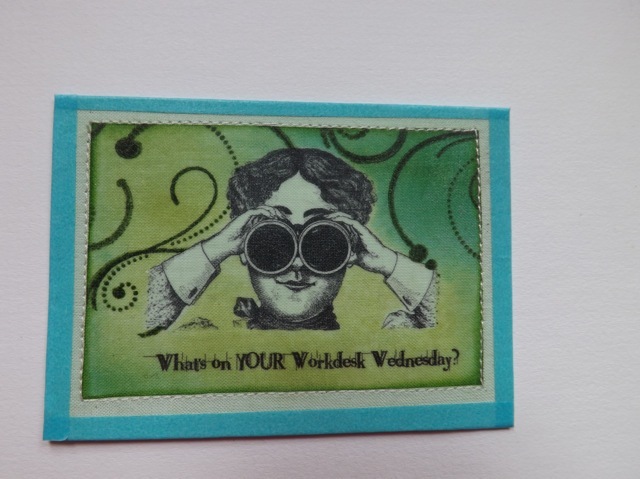 I am loving the UTEE embossing. I left a sort of pebble-y finish on some of them which gives a more textured look, I think. 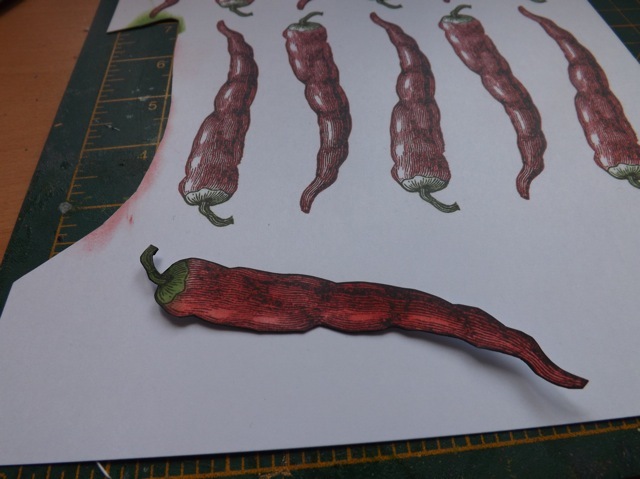 That, and the three different sizes of chilis keep it from all looking to flat. I did do the smaller green ones and added all the numbers, which I think I prefer. I am undecided if I want to add just a few more – leaving SOME of the background peeping through helps the illusion the whole thing is just a big pile of chilis, and I’m not sure if filling in will take that away. Like many things, I think I will live with it on my desk for a little while and then decide. The image is from The Graphics Fairy. I downloaded it ages ago, with the idea of using it when making the booth sign for DH and his chili cook-offs this year, but haven’t needed it yet. 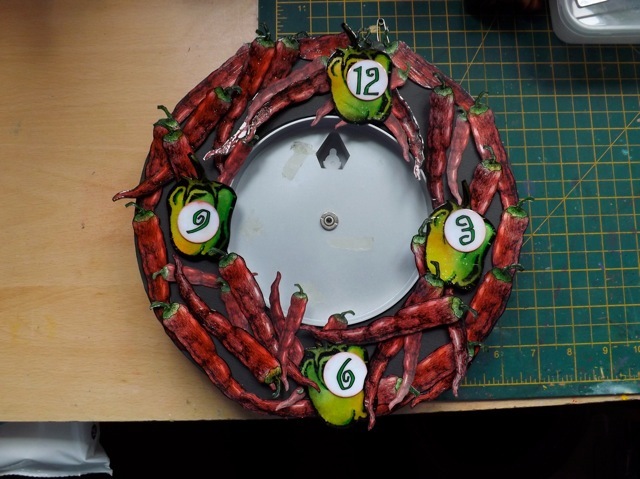 When he mentioned me making a chili clock last week, it was nice to say I have the perfect image for that! and open it up to show him. And I’ve been playing with my program to see if I could achieve something like the blackboard effect that seems to be EVERYWHERE at the moment. I could do it in Photoshop but I’m more interested in seeing if I can do it in Intaglio. Sort of. I discovered a whole new menu that I haven’t ever played with at all, using Corelimage. Lots of nifty things to explore. The text is too crisp and clear, but overall it’s interesting. More play needed, I think. 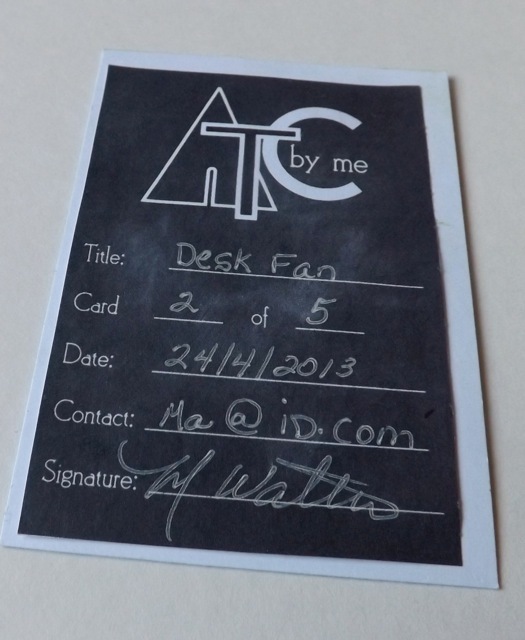 And it occurs to me that having a black ATC-backer that requires you to add the info in white pen might not actually be useful at all. So I may abandon it for this little project, and wait for a better application of it. 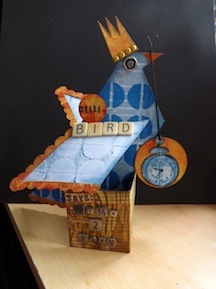 Categories: ATCs, paper sculptures, quilting | Tags: ATCs, clocks, paper sculpture, printables | Permalink. 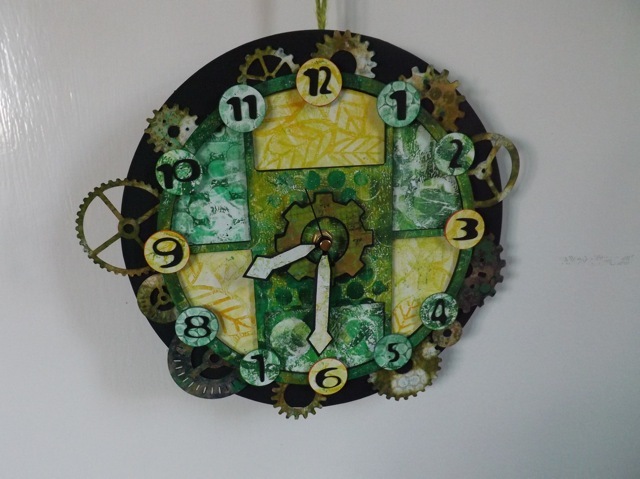 DH actually liked my Gelli clock. He finds the ticking comforting. He tweeted it, silly man. Then he asked me if I would make one with a chili theme for as gift. That’s what’s on my desk today for WOYWW. 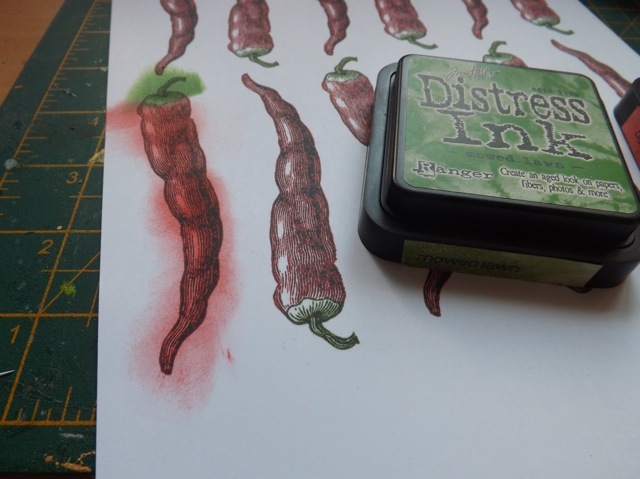 I’ve printed the vintage chili pepper image loads of times then coloured it to give it a much brighter, more intense look. Am I the only one who finds cutting out relaxing? I’ll bet not! 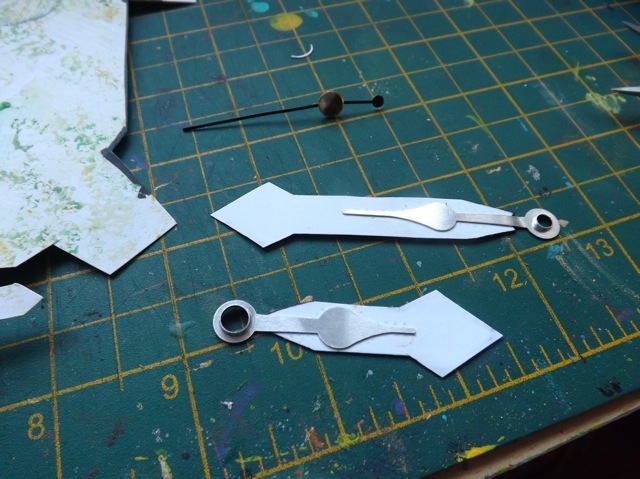 Now I could use a tip for brushing on Glossy Accents so it looks smooth, without seeing the brush strokes. 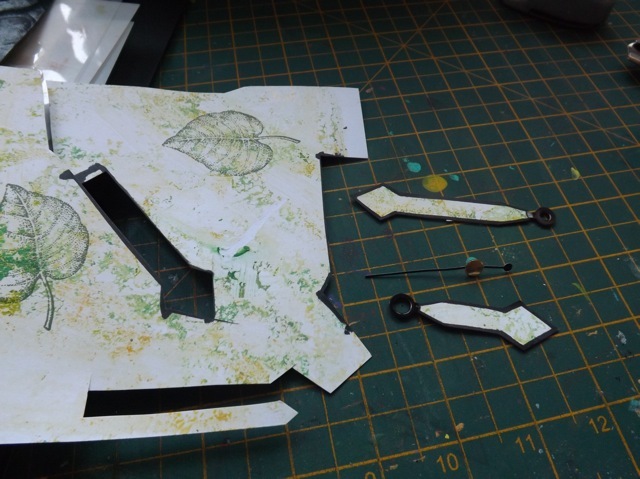 I don’t have nearly enough to flood it over all those chilis and I need to do another sheet of them as well, but paint brush or foam brush, the stokes are obvious and it’s not the look I want. Different sort of clock, one I bought like 5 years ago and never completed, but I think I can make it work – IF I can get the Glossy Accent smooth! I may bail on it and go with my matte Mod Podge, as that looks better to my eye even if it isn’t shiny. Or maybe clear embossing? I have a ton of embossing powder so I may do that in the end. Have a happy WOYWW!! 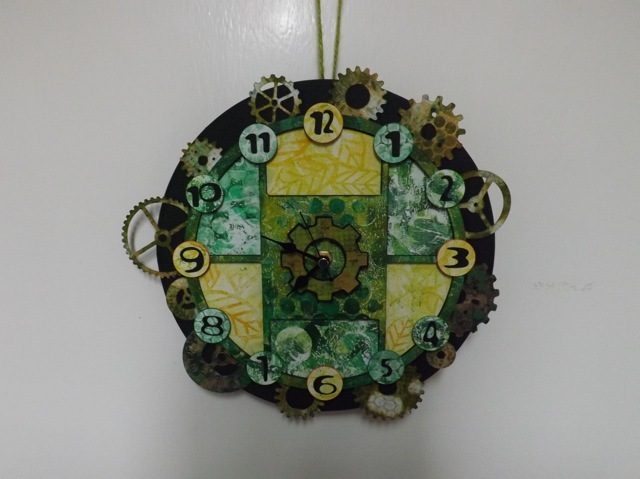 So after I made my Gelli clock, I installed it in the lounge. Two immediate problems presented themselves – one, the TICKING, OMG THE TICKING. It is SO LOUD. As someone who really, really hates sounds like humming, whistling (especially tunelessly) or any rhythmic, repeated noises, like tapping of feet or jangling of keys, this is driving me INSANE. No way to fix that. 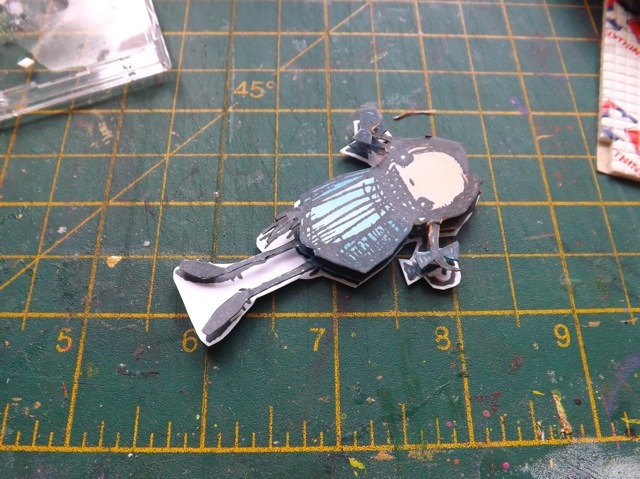 But problem two, the difficulty in seeing the black hands over the highly patterned face of the clock…that I can fix. 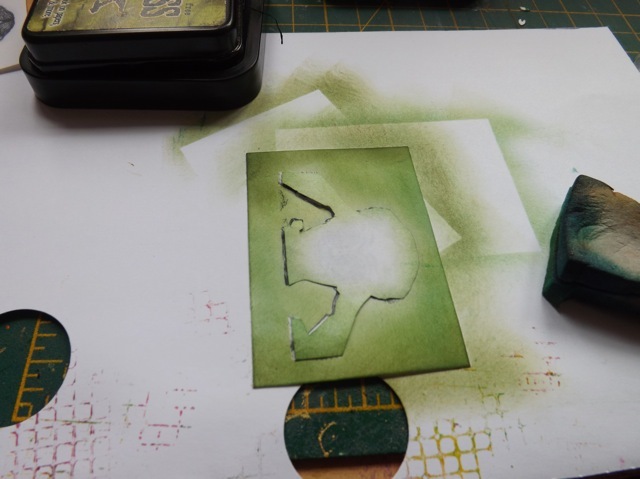 I cut a sort of arrow shape from a spare Gelli print. This was on fairly heavy card, so slightly rigid, but not too heavy. I feared the extra weight on the hands might impede their proper working. I lined the edges with a black pen, just hoping to add some additional contrast.Then I stuck them to the existing hands – temporarily, while I test to check the timekeeping. I installed them. 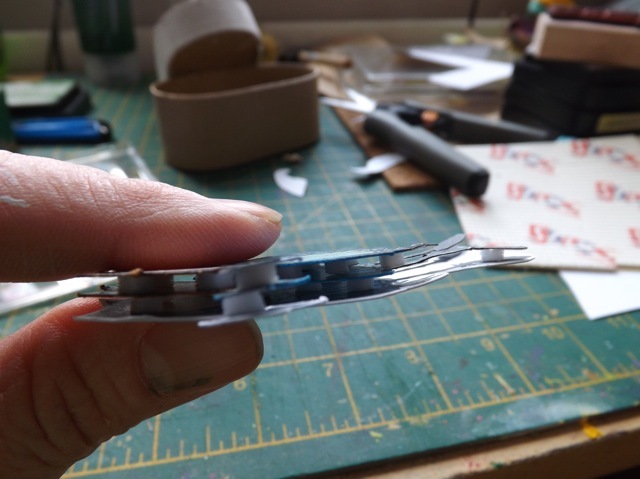 The only thing to make sure of is that the second hand clears the minute hand, and the minute hand clears the hour hand – you may need to very slight bend them to make sure of that. I think you will agree this is going to be FAR EASIER to see, late at night, in a semi-darkened room where the TV and one small lamp are the only lights. It’s been running for a little while and SO FAR. 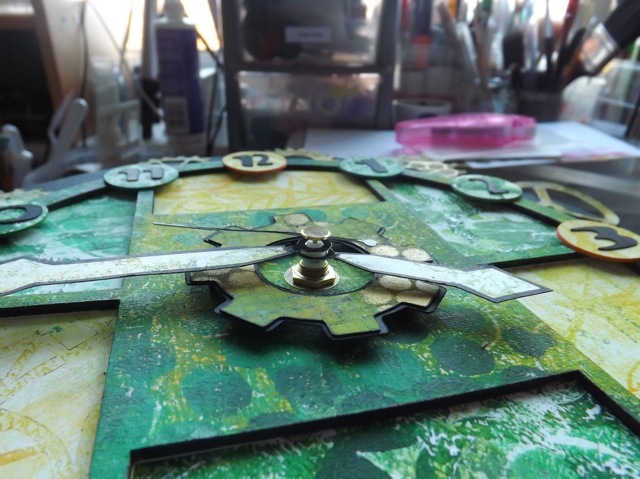 the clock on the wall and the Gelli clock (and the clock on my Mac) seem to all be in sync. The hands have made multiple revolutions and they are positioned correctly so they don’t interfere with each other. I am tempted to replace the clock mechanism with a quieter one, however. As it stand now I suspect it will have the battery taken out and go in a box. Shame, as I like the look of it, esp. with the improvement, but honestly I would surely check it before yo go to the trouble to make one to see if the ticking, esp. in a quiet room, will make you crazy. I keep thinking it will fade into the background but I am now far too aware of the passage of time – and at my age, this is NOT a good thing LOL! 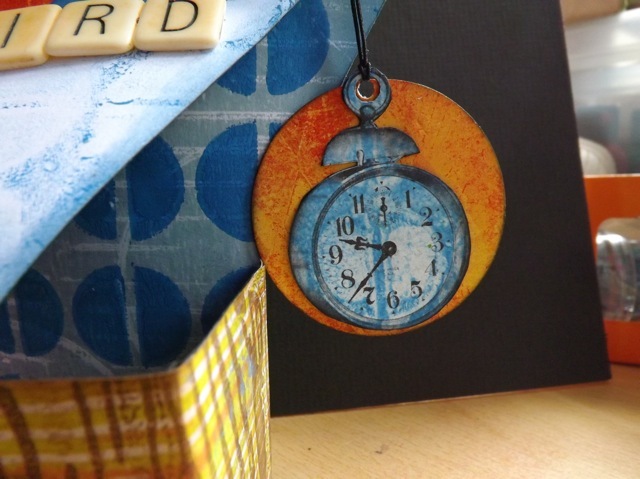 Categories: Gelli plate monoprints | Tags: clocks, Gelli plate, how-to | Permalink. 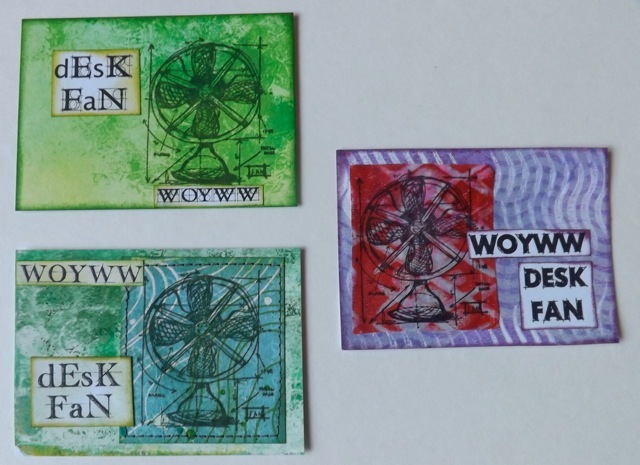 I am re-visiting something I did a while back, using inks and stamps of Tee Shirt Transfer paper, as one of my (many) experiments in preparation for the WOYWW anniversary ATC swap. I am hoping that whoever ends up above me (or is it below me? DOH!) on the list will not see this, or if they do they will at least know this is only one of the things I am playing with and it is by no means my final design – or, in fact, if I will offer all my experiments as available for swapping. I just don;t know at this point. 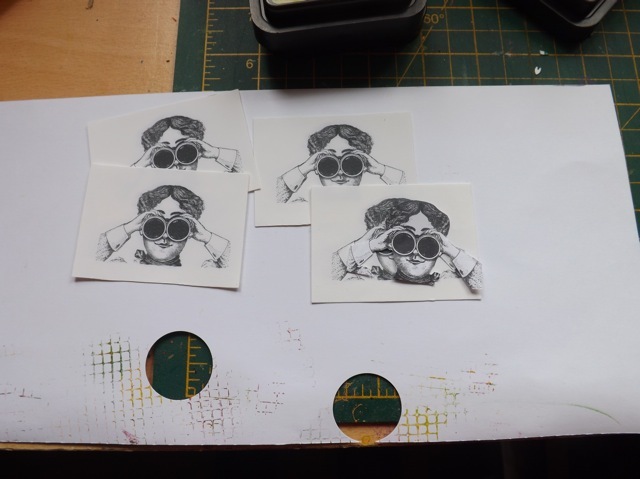 I may make a handful of one design and offer them, I may just make one (I did that last year) as I have been testing out LOADS of ideas, some which ended up in final ATCs, some which were only good for the bin. In any case it’s still more than a week away so plenty of time to try out one or two more ideas. But I must say I DO like this one a lot. Using my all time favourite image from The Graphics Fairy, and gosh, I forget, but I think I DID use her last year too, so if I used her AGAIN, it would become a trend/ritual/habit, which I am not opposed to. The whole POINT of WOYWW is to look at desks all across the world and see what others are working on. So the Quirky Lady seems entirely appropriate, given that she is looking across a great distance at SOMETHING interesting. Anyway, what I did was printed the lady on to Tee shirt Transfer paper. This version is one where you iron it on flipped, so all text needs to be reversed to read right. The superimposed image is actually a mask. I started by smudging my Distress Ink on the background, using the mask to keep the lady white. With the mask still in place I stamped, with Archival ink, on the background. 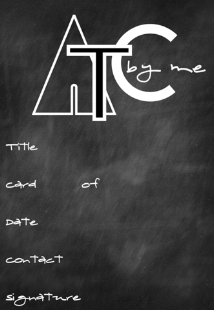 It will become clear the photos don’t show my final ATC because I ended up not liking the font I picked for the text. It was not readable enough in such a small size. 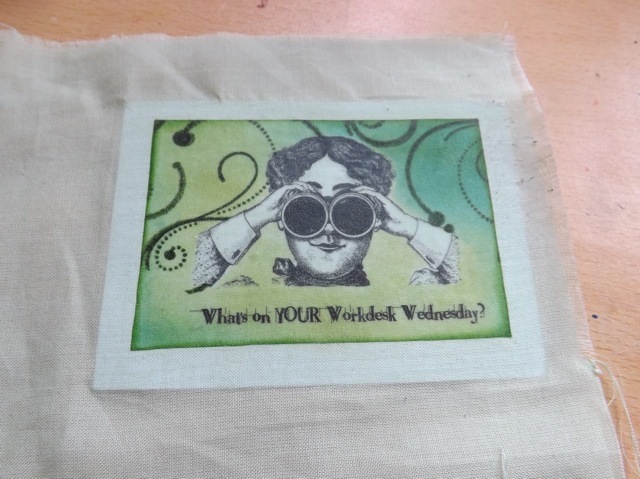 Once I had decorated the whole bit of transfer paper, and I ended up with a piece that was about 2 x 3, so just smaller than an ATC sized card, I ironed it on to the fabric. 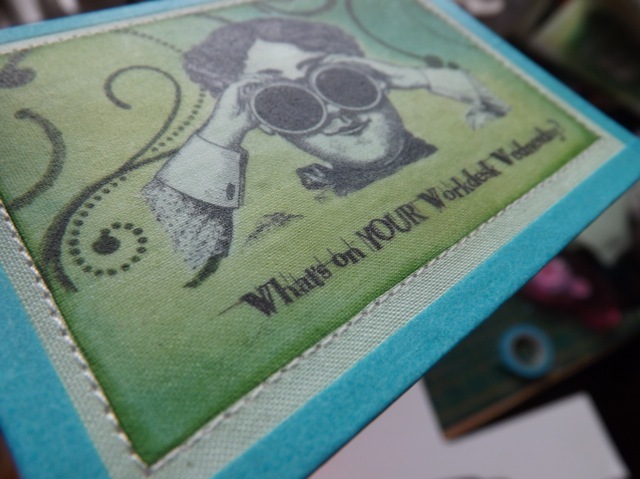 I glued THAT to the ATC blank and stitched around the main block. 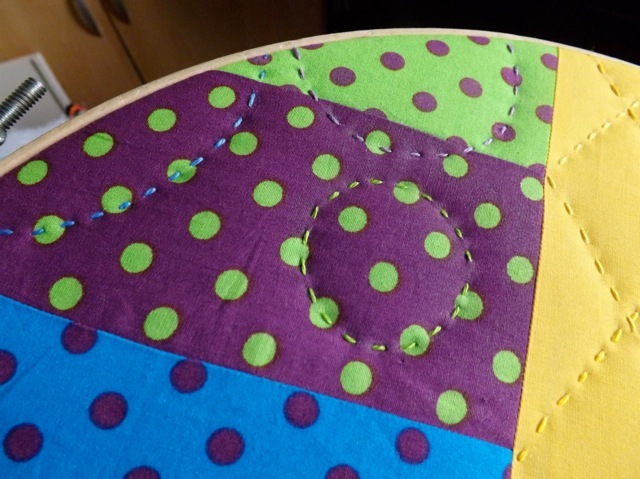 Because the fabric I was using was very loosely woven, the edges, even with the glue, dis fray a bit, so it was, as it so often is, Washi Tape to the rescue! I think it finished it off nicely. 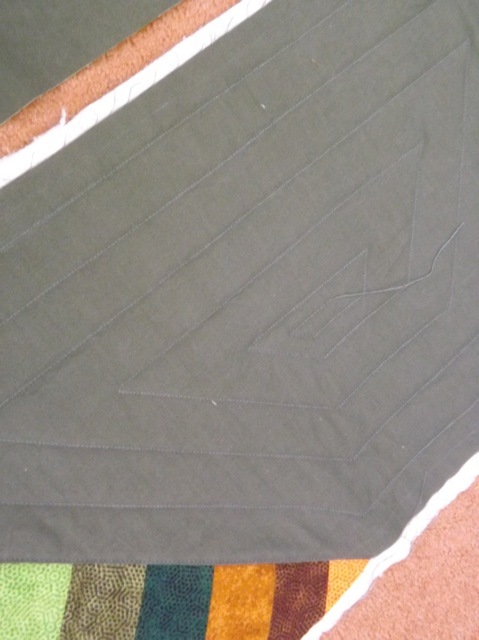 I hope you can see the texture of the fabric and the stitching in this photo. The only thing that I am not totally happy with is THIS tee-shirt transfer paper allowed too much of the fabric colour to show thru. She has a slightly sickly green complexion, where the other paper I have, where you peel off the transfer and iron it on, right way round, comes out with true WHITE where I masked. 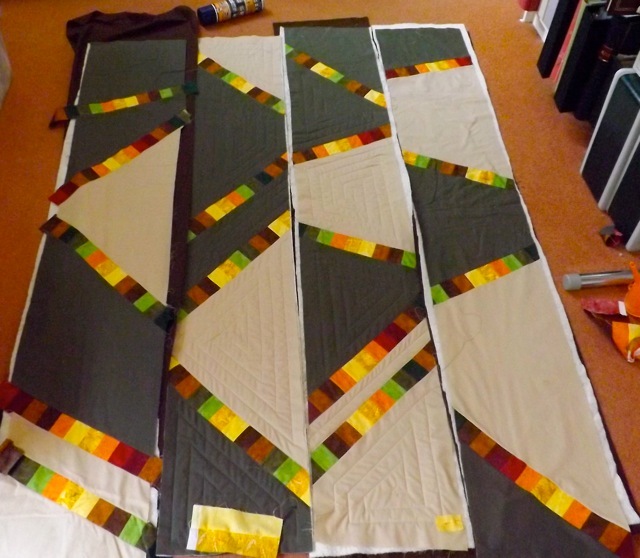 Not sure if I will try other fabric or not. White fabric will still show all the inking and stamping while leaving the lady white, so I will have to play around a bit more then decide. Noted: It seems I never shared my ATC from last year, I left it up to the person I sent it to for the swap to do it, so until I figure out who that was and check HER blog I won’t know. DOH! Categories: art, ATCs | Tags: art techniques, ATCs | Permalink. 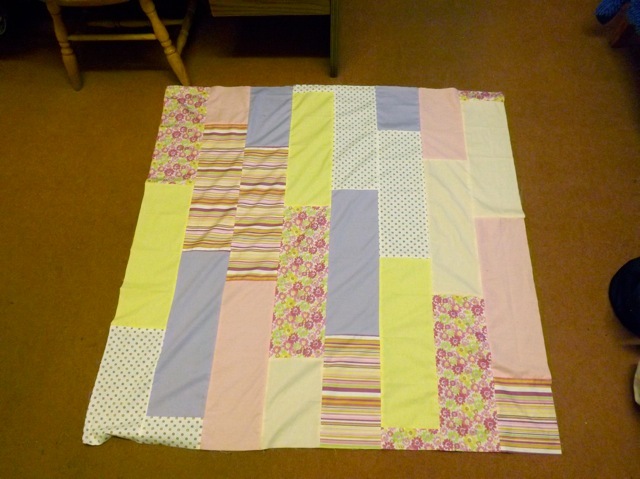 I was thinking about this idea but needed to work out the best way to get a long enough strip with the 6 x 6 plate. It finally occurred to me that as the rosette is folded, printing 1/2 the plate on one edge and the other half in a line, would work fine. You don’t really NEED to have a continuous print with no obvious join or overlap, as the folding is going to disguise it anyway! 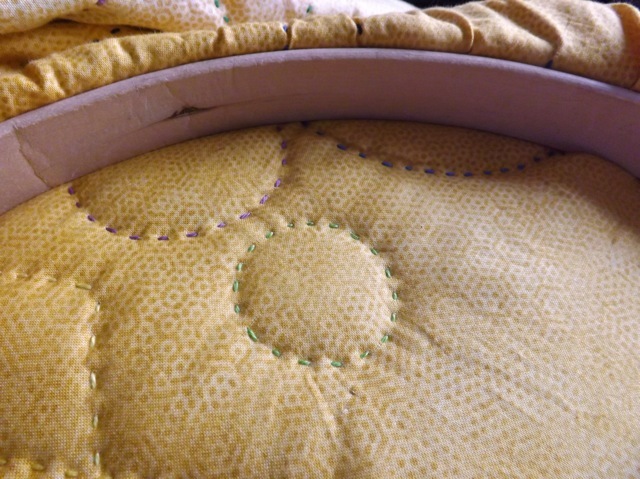 You can see the top edge of the paper there above, where I sliced off the 1 1/2 inch strip to score and fold the rosette. 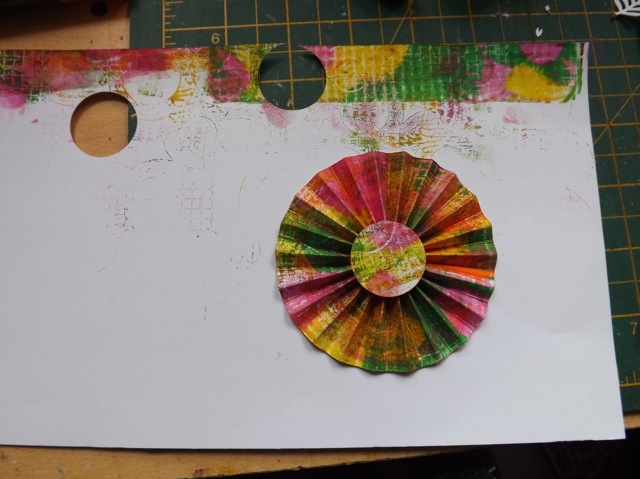 I’ve run out of the pre-cut Tim Holtz die rosettes that Julia very kindly brought me when she lent me the die, but I see no reason you couldn’t cut them, then print on the cut rosettes with the Gelli plate and then fold them. I did it old school, with a scoreboard. Pretty, hummm? 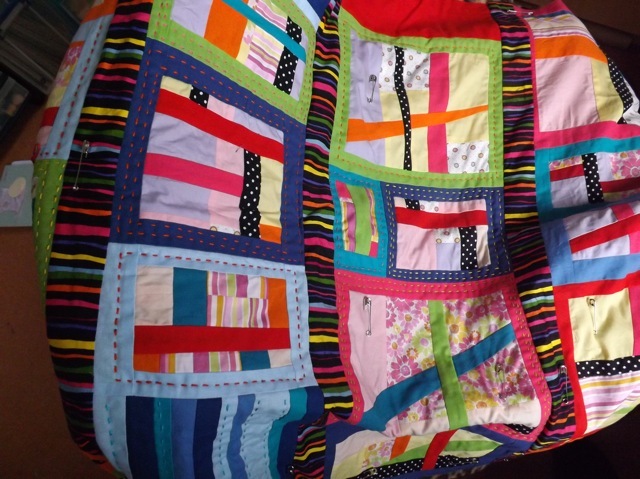 I would think this would be a good use for prints where you like the colour but the pattern you are less keen on, if you had the bigger plate and didn’t have to intentionally 1/2 print along the edge to get enough length. and I am sure the word rosettes would work fine. I can see it looking good on a clean-up print, where the colour of the print is painterly but quite light so the words really show. 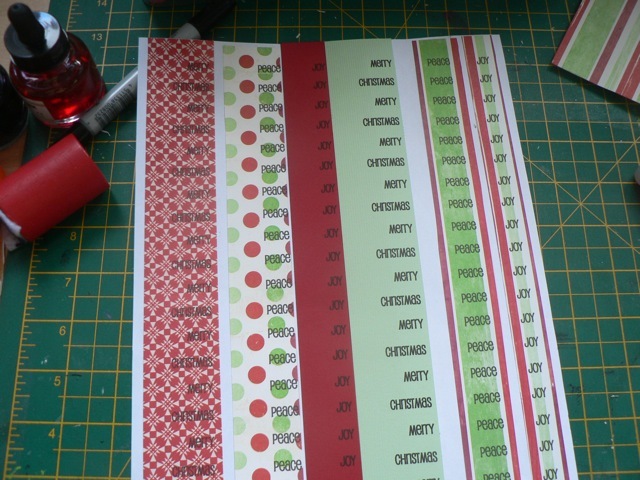 It looks fine on patterned paper, so I am confident it will work! No time to give it a go at the moment, but when I do experiment, I’ll be sure to at least add a photo. 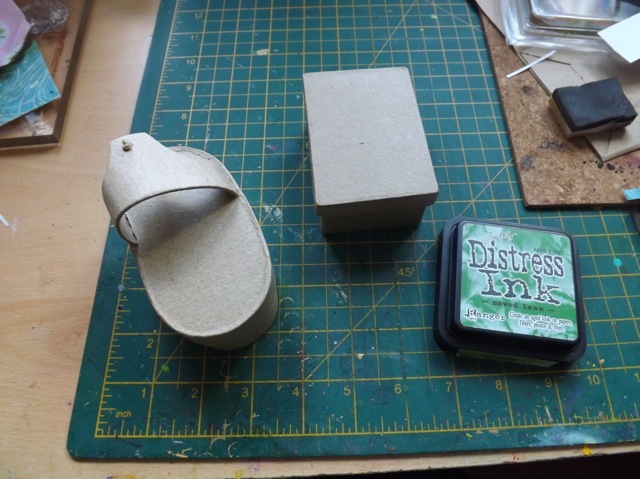 A couple of tips: First, make darn sure your print is DRY. If you are using a scoreboard, score on the BACK of the print – the bone folder might chip off the paint if you score too deeply or your scoring tool has quite a sharp edge. Scoring the back will make no difference to the folding. I would also suggest thinner paper. This is using the Staples Text and Graphics paper (dirt cheap for a ream of 500 – maybe £6) which is I think about 125 GSM. Thicker and the rosettes will score and fold less easily. 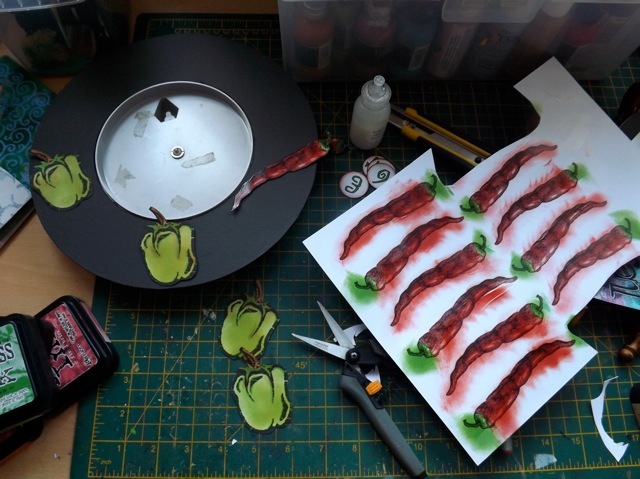 The thing is, while I just LOVE printing with the plate, I quickly amass piles and piles of prints and since I don’t really art journal and I don’t really collage, I kinda have to figure out a way to use them that fits the kind of stuff that I DO do. This would look very pretty on a card front, with a Gelli print background in lighter colours, would look pretty hung up by twine in the window – a bunch of them would look even better – and is thin enough that it would work on something like my Gelliprint paper bag book or on a layout or for a rosette wreath. 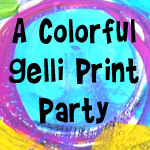 Basically I think you can pretty much use a Gelli print as a substitute for patterned paper, for just a more “arty” look! I have one or two ideas to test out in addition to the printed word rosettes so watch this space! 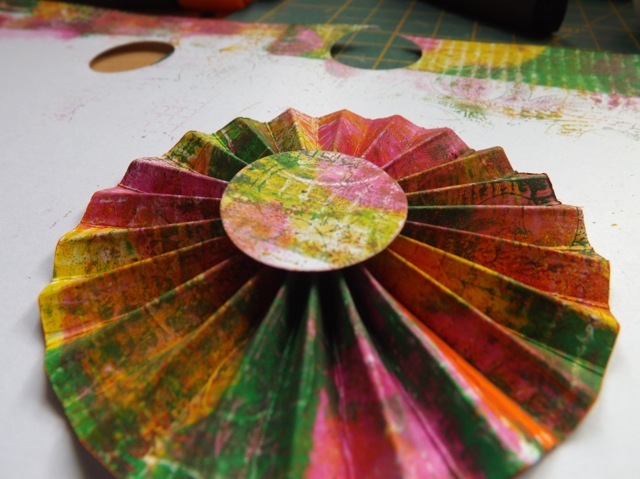 Categories: art, Gelli plate monoprints, rosettes | Tags: art techniques, Gelli plate, rosettes | Permalink. 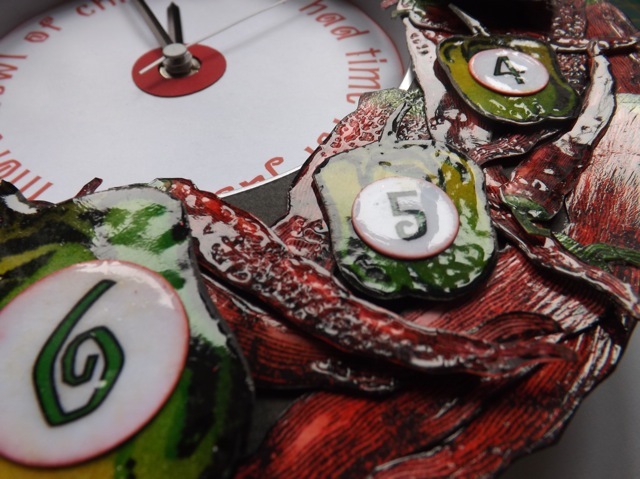 I finished up the Tando clock, using Gelli printing, and am really pleased with the results. 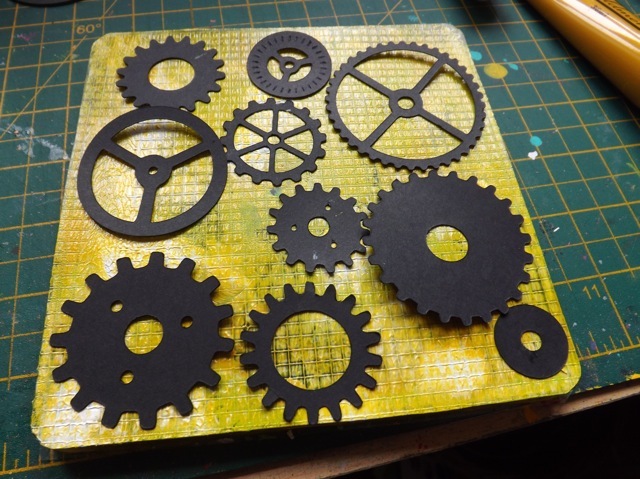 I found a nice SVG of a variety of gears that I was able to cut with the Cricut using SCAL. as I THOUGHT I had a gears die and didn’t. Typical. 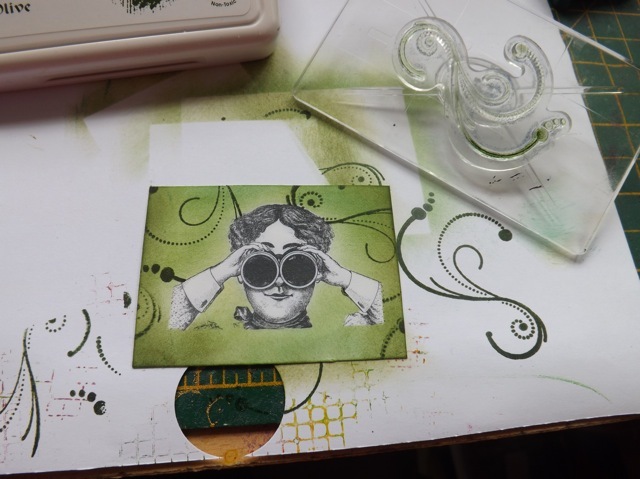 I cut them from black card and used the Gelli plate to print on them. 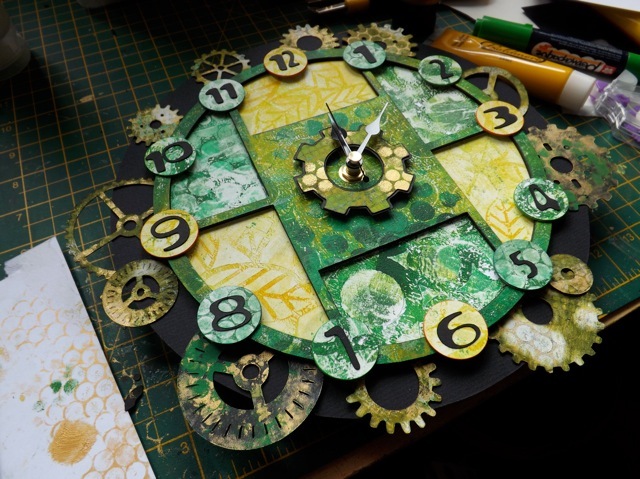 Same basic colours as the clock-face, so I used gold to highlight rather than copper, just cause I think the gold works better with the grassy greens while copper would work better with more verdigris (personal preference, I guess). I fit almost all of the gears on the plate at once! Just laid over another print so I could press down and got the pattern as a second layer on that. Two for one! I think it should be OK, but I feel more comfortable living with it for a bit, just to be sure! I think I MIGHT want to paint the hands white or something, although it IS easier to see in real life than it shows in the photo. It was fun – I would def. do another.